LISBON, Portugal - A court has allowed captured American fugitive George Wright to leave jail and stay at his Portuguese home while he fights extradition to the U.S., his lawyer said Friday. A judge hearing the case released Wright from custody on condition he remains at his house near Lisbon and wears an electronic tag that monitors his movements, lawyer Manuel Luis Ferreira said. 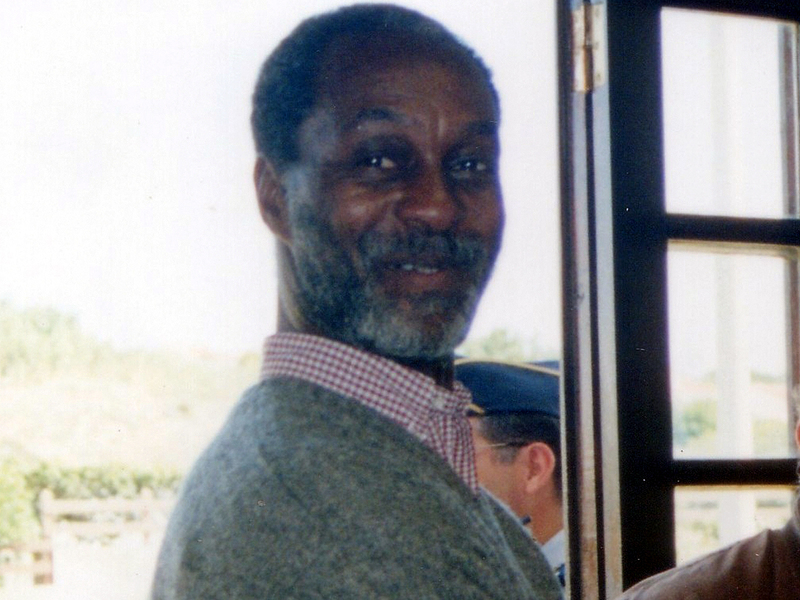 Wright spent seven years in a U.S. prison for a 1962 murder in New Jersey before escaping in 1970, and was on the run for 41 years until his arrest in Portugal almost three weeks ago. Wright had been held in a Lisbon jail since he was caught. "He can't leave the house and he can't speak about the case to anyone," Ferreira told The Associated Press. Under Portuguese law, court proceedings and police investigations are confidential. The U.S. is trying to extradite him to serve the rest of his 15- to 30-year sentence. Portuguese broadcaster S.I.C. showed Wright arriving at his home, in a hamlet near a stunning beach about 40 kilometers (25 miles) from Lisbon, Portugal's capital, on Friday evening. Wright, his head shaved and wearing glasses, was escorted into the house by two police officers. He kissed his Portuguese wife, Maria do Rosario Valente, who was waiting at the front door before going inside. In comments to reporters outside the house, with Wright standing behind him, Ferreira said his client was happy to be home. "He wants to say ... that he doesn't intend to run away. He just wants to spend his life here with his family," Ferreira said. Ferreira contends that Wright is now a Portuguese citizen and should be allowed to serve the remainder of his sentence in Portugal, where his wife and two grown children live. U.S. Justice Department spokeswoman Laura Sweeney, contacted via email, declined to comment. Wright was captured in the seaside village after authorities matched his fingerprint on a Portuguese identity card to one in the United States. Until his arrest, Wright lived for years in the whitewashed house down a cobblestone street. Locals say Wright spoke fluent Portuguese and was a regular churchgoer who lived from odd jobs. Many thought he was African. Wright got Portuguese citizenship through marriage in 1991 after Guinea-Bissau, a former Portuguese colony in West Africa, gave him the new name of "Jose Luis Jorge dos Santos" and made him a citizen. Wright broke out of Bayside State Prison in Leesburg, New Jersey, on Aug. 19, 1970. In 1972, Wright  dressed as a priest and using an alias  hijacked a Delta flight from Detroit to Miami along with others, police said. After releasing the plane's 86 other passengers for a $1 million ransom, the hijackers forced the plane to fly to Boston, then to Algeria, where the hijackers sought asylum. No one answered the phone Friday afternoon at the Howell, New Jersey, home of Anne Patterson, daughter of Walter Patterson who was shot and killed by Wright and an associate.